When we last left our heroes (and villains) at the end of Maelstrom, Josh needed to learn the truth about who his father was in order to put an end to the dark agenda that the fringe splinter group (the Protectorate) is trying to make happen. For this to happen our chief hero, Josh Jones must learn to fully embrace who he has been labeled as, that being The Paradox, and travel to a time where no other time traveler has been able to go… into the future! Josh and Caitlin make that trip and find themselves in an old, run down laboratory facility. Meanwhile, Caitlin’s parents, Thomas and Juliana have been traveling throughout time in their submarine, the Nautilus, by using it to traverse the Maelstrom, and after having rescued the Colonel, are trying desperately to now save him from dying. Meanwhile, Ravana and her son, Dalton, have some very dire plans for the world by bringing about the end of times. However, unbeknownst to Ravana, Dalton has his own secret plans and ambitions, which basically has him becoming one with a race of powerful beings called the Djinn. Meanwhile, a scientist from the book Anachronisthad acquired Josh’s tachyon device and learned about the power of time travel, and he’s been responsible for some of the changes in history because of his own selfish desires. That is when he bumps into Josh and Caitlin, who decide to travel back in time while at the old lab, just to see how things were when everything was brand spanking new, only he was expecting them and now plans to use Josh as part of his goal as well. Meanwhile Dalton has killed a number of people in a most shocking sort of way, and believes he now has the means to control the Djinn, so he travels to a point in the Maelstrom where he expects to met and control them. Meanwhile Caitlin manages to escape her captivity and rescues Josh, where they travel back to a place called the Citadel where they study something known as the Eschaton Crisis. Meanwhile, Thomas and Juliana realize they can’t save the Colonel, so they go to the only place they believe where he can be helped, and that is the Citadel. Meanwhile, Dalton gets more than he bargained for while in the Maelstrom waiting for the Djinn. Meanwhile, Josh explores the Colonel’s timeline, which has been completely fractured and is bringing about his death, so Josh has a psychic get together with the Colonel in the hopes of getting him to remember parts of his life that will allow for his timeline to be rebuilt and then save his life. Meanwhile Ravana, while exploring the Maelstrom learns of her son’s fate, which brings about her own sticky ending. Meanwhile Caitlin feels she doesn’t know the complete truth after meeting her uncle and feels she needs to go back to Solomon’s Temple to find out why her parents went, and subsequently disappeared, during that top-secret mission. Meanwhile, the Eschaton Crisis has gone full tilt and Josh feels he’s the only one who can stop it. Whereas the first two books were pretty linear in their storytelling, Eschaton is one gigantic hot mess right from the very beginning. Author Andrew Hastie had been able earlier to craft some highly compelling stories, but here it’s just one gigantic runaway train in the dark. Each chapter continually shifts from one point of view to the other, which is doubly frustrating that in some cases the chapters are only two pages long. For the first quarter of the book it does nothing but serve to create a sense of confusion as well as lack of cohesion. Then, when Hastie finally brings us to the Citadel and we start to explore the mystery that is the Eschaton Crisis, the story becomes nothing more than “chrono-babble.” I was failing to make any sense out of it, so I just resigned myself to accepting whatever was there on the page at face value. There is an overall feeling of direction, especially once Josh decides to go after Dalton as most readers would be looking forward to a big showdown between these two. The hatred, especially on Dalton’s part, is not lost on anyone. Unfortunately it jumps around so much in time that I had to read that part of the story three times just to wrap my brain around where and when they were. Sadly it all goes downhill from there. Hastie does something right towards the ending that put me in a seriously bad funk even before I finished reading the last page. It’s as if he painted himself into a corner because the ending of this series left me feeling completely cheated. There is no proper resolution, and instead overly emphasizes the deus ex machina that I had previously been so concerned with happening. It would be awful to read the first two books only to have to stop because the final installment didn’t live up to the reputation of its predecessors. On the other hand, I can’t recommend the reading of this final book because it fails miserably to live up to the standard set by the first two books. With that understanding, I would have to tell anyone who might be interested in reading “Infinity Engines” to not bother with the series, only because of how terribly disappointing the third book is. 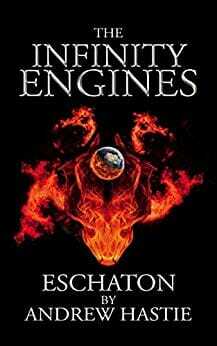 Eschaton is a book with little character development and far too much chrono-babble. Eschatonreceive 2 out of 5 tachyons.